This British engraving, circa 1780, depicts a “View of the Attack on Bunker Hill , with the Burning of Charles Town, June 17, 1775.” Although it was costly, the British were victorious at the end of this famous battle. Legends are often part truth and part fiction. The truth about the first large-scale battle of the American Revolution? It was a battle that should never have taken place on a hill that should never have been defended. The fiction? The hill was actually Breed's Hill, not Bunker Hill. General Israel Putnam (who left his plow to defend his country) was in charge of the patriots, assisted by very capable officers including Colonel William Prescott. At the time of the Bunker Hill battle (June 17, 1775), the Americans did not have a navy, but British naval ships were in Boston Harbor - very near to Charlestown. The Colonials - about one-third were African-Americans - were dug in along the high ground of Breed's Hill. Fighting with notoriously inaccurate muskets that were slow to load and produced lots of smoke, the patriots were low on ammunition. When the Redcoats, who marchedup the hill in formation, were about 15 paces away, the patriots fired, halting the British advance. The Brits stormed Breed's Hill a second time. Again, the patriots forced a retreat. By the third British advance (look at the bottom of the link for details of the three attacks), the patriots were out of ammunition. Using their bayonets, and throwing stones, the Americans could not hold Breed's Hill. The victory at "Bunker Hill" cost Britain more than 1,000 casualties - about half their force. Four hundred patriots died, including General Joseph Warren. 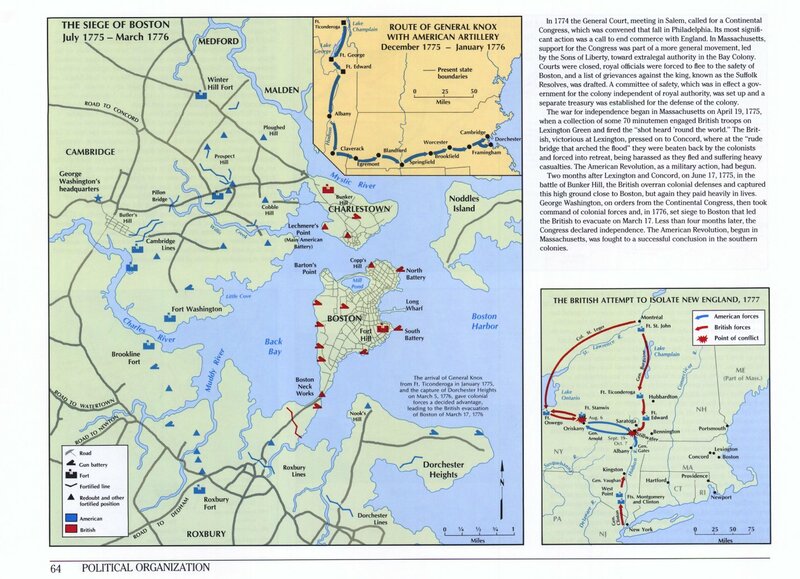 Victorious - as depicted in this U.S. Military Academy annotated map of the battle and its aftermath - the Redcoats began a siege of Boston. America, meanwhile, appointed a reluctant Commander-in-Chief: George Washington, a farmer/surveyor from Virginia, married to Martha Custis, and a hero of the French and Indian War. Today, we can still see his original commission. Bos, Carole "THE BATTLE OF BUNKER HILL" AwesomeStories.com. Nov 06, 2015. Apr 23, 2019.